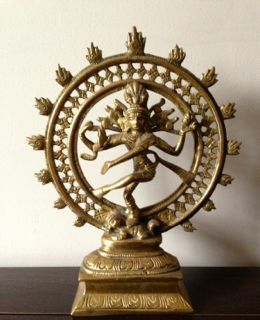 As much as I like to discover the esoteric meaning of Hindu Gods and Goddesses, I am equally fascinated by their history. Where they came from, how they evolved and their place in the world in present times. In my previous posts I have often touched upon other forms of the deities, as they are worshipped today, in other countries or religions. 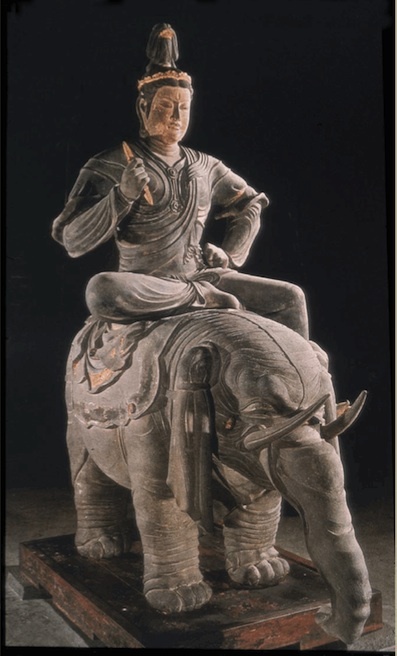 A few days ago I came across an excellent post by Videshi Sutra on the integration of Hindu devas into Buddhism and their journey to Japan via China. This is a historical phenomenon, which entertains and fascinates me to no end. Buddhism had a huge impact on all East Asian cultures, especially on their pantheons of deities. 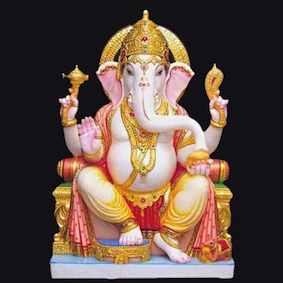 On first glance it might seem odd that a reform movement, which rejected many of the core tenets of Vedic religion would transmit a belief in Vedic deities. This apparent oddity is a misunderstanding of Buddhism’s “atheism,” and a misunderstanding of what a “Deva” actually is. Most forms of Buddhism, while rejecting the concept of all-powerful gods or creator deities, openly accept the existence of powerful supernatural beings. In the Buddhist pantheon, the Devas have generally converted to Buddhism and now serve as his protectors, the protectors of his teachings, or as helpers to mortals who are trying to achieve enlightenment. 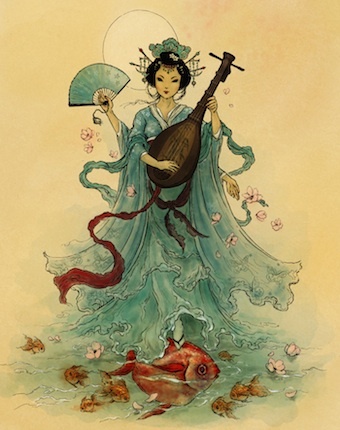 To find out more on how the Buddhist versions of Hindu gods were integrated into Japanese culture ( with fantastic images) read the rest of the article here Hindu Devas Take a ( Silk Road) Trip to Japan! Born of the Sky and the Earth, he was an Aditya, one of the first deities. He was the copper hued Great God of War, Rain and Thunder. 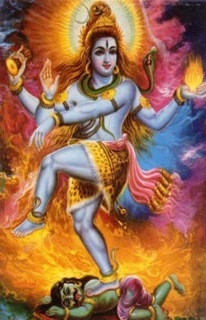 Worshipped more than any other deity in the Vedas, he was said to protect the gods and men alike. Sitting atop the celestial Mount Meru he supported the heavens with its thirty-three gods and guarded the directions. 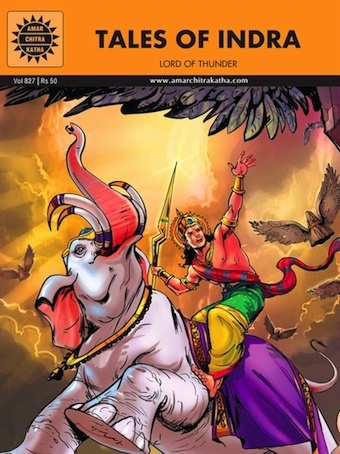 Riding his white elephant Airavat and wielding the thunderbolt he led the mighty Sun, Fire, Air and Water into many fierce battles with the demons. He was the slayer of the dark dragon Vritra who stole the waters from the earth. He even fathered Arjuna, the great hero of the epic Mahabharat. So why do we no longer care about this King of Gods, the Great Indra ? At what point was he dislodged from our consciousness as Sakra, the powerful one, to become a lesser god with a bad reputation, to be remembered only in folklore? He was quite simply traded for loftier gods. The Hindu pantheon has continuously shifted and changed. As the Hindu philosophy evolved, so did the gods and goddesses. The Vedic culture was based as much on worship of Nature as it was on trying to understand it. Since the earliest of times we see a civilization obsessed with science and the pursuit of knowledge. Even the Rig Vedic hymns which seem like simple dedications to Nature and its elements are full of very detailed and accurate astronomical observations. This quest for knowledge did not stop at the visible Universe. The Creation Hymn hints at a ‘Reality’ that cannot been seen or known. A reality that existed even before the gods came. The Upanishads, written long after the Vedas, are all about uncovering that hidden ‘Reality’. By now, the rishis, seers, through centuries of meditation, had all come to a common conclusion that what is outside is also within. We are a part of the whole and each part is whole. ‘Aham Brahmasi, or I am Brahman ( cosmic consciousness) is one of the three “Truths’ explained in the Upanishads. Such lofty ideas needed loftier gods. The heavens were no longer the ultimate realm. And, thus we see the rise of Brahma, Vishnu and Shiva, as the higher principles of the Universe. In their shadow Indra, the God of War becomes quite irrelevant, even undesirable. The focus had shifted from violent conquest of one’s enemies to conquering one’s mind; from pleasing god to realizing god ! But not all is lost for the once King of Gods. The legacy of Indra lives on in a benign form in Jainism and Buddhism wherein he is known as Sakra in Sanskrit or Sakka in Pali. For Buddhists in Tibet, China and Japan he is Taishakuten, a powerful guardian deity and is often depicted riding a white elephant. Legend has it that the city of Bangkok was gifted by Indra and built by the celestial architect Vishwakarma. Perhaps it is for the best that in these times of war and conflict, we remember the warrior-god in his gentler avataars. Hindu mythological stories were originally composed in Sanskrit, in the form of verses or shlokas. These verses often seem to have more than one meaning, which makes Sanskrit scholars think that these stories are more than just stories. They are like codes, cleverly disguised to pass on certain ideas and perhaps keep records of some important events. 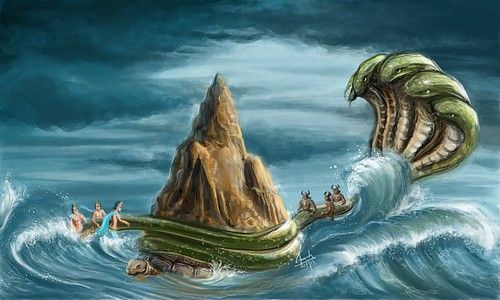 The Churning of the Ocean,Samudra Manthan, is full of such secrets and hidden meanings. Given below are some of them. A common interpretation of the myth is that the Devas and the Asuras are the good and bad tendencies in all of us. And, the churning of the milky ocean waters is like the agitation we experience when we are troubled.It is the agitation in our consciousness. The story tells us that in the fight between good and bad, we must steady our mind like the mountain by supported on the back of a Turtle. One of the names used for the mountain in the original story is ‘Mandhara’ which means a steady mind. While the Turtle is often used as a symbol for controlling the senses. Just as a turtle withdraws its head, legs and tail into its shell so also we can learn to control our six senses. 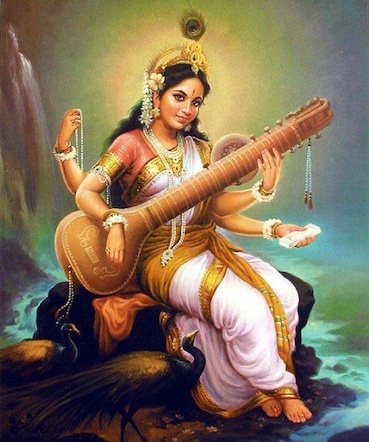 The serpent Vasuki, represents desire that is constantly tugging us between the good and bad. As we fight this battle within our selves and try to overcome the bad, many emotions and thoughts come to the surface. At first they are negative like the Halahal poison. But, if we swallow it like Shiva and don’t give up, we will be rewarded by great riches. These are symbolized by Laxmi, the goddess of wealth; Kamdhenu-the wish-fulfilling Cow; the Kalpatru – the wish-fulfilling tree: the Kaustubh gem, etc. Finally, we will get biggest treasure of all, realization of the Ultimate Reality or Truth which is the true nectar of immortality. The second interpretation refers to a practice of yoga. Yogis say that when the all the senses are withdrawn and mind is stilled in meditation, the Kundalini energy which sits, coiled like a serpent, at the base of the spine called the Merudanda ( Mount Meru in the story), rises upwards and reaches the crown of the head to give a person a glimpse of the Truth. Vishnu’s incarnation as a turtle in the story draws another obvious parallel. Vishnu has ten avatars .First came the Fish, then the Turtle, then a Boar, then Half Man-Half Beast, then a Dwarf followed by Parshuram the sage, Rama, Balarama, Krishna and the last one yet to come is Kalki. The order of these incarnations seem like Darwin’s theory of evolution. Could these be Hinduism’s idea of evolution of man. Or does it imply a natural hierarchy? Is it a Creation Myth? Which of these above interpretations of the story do you like most? Can you find another meaning hidden in there? If you do , I’d like to hear about it.